Ugh. This series gets my blood pressure up. It's been a tough watch. A combination of shoddy, detrimental officiating that doesn't appear to be the same as the other series' and star Flames player no shows (No CP, it doesn't have to be one or the other) is rage inducing. 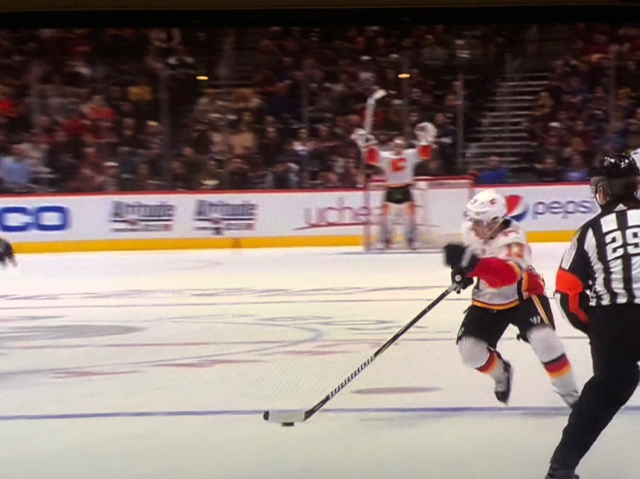 Holy that call on Gaudreau was so bad. Like what in the world. Interference, holding, Hooking. 3 blatant fractions. What garbage refs do we have. Is it the same muppets officiating game 4 as well? It's more on the flames than on reffing as we've overcome poor officiating before, but I would definitely give these guys in stripes a piece of my mind. How can you be so bad at your job and be employed at the highest level. The problem is the officials can't seem to find a balance. One game they put their whistles away and everyone is trying to kill each other and players are getting match penalties and the next game they are making weak calls one after the other. Its not just our series either, every one is being called like this. Listening to Galley: You need net drive. Throw pucks at net and have guys there. Dangling four guys ain't gonna cut it. CGY need to be able to sustain offence against the pack it in the middle defence. How about some positive vibes? PGT quotes from October win against Avs. Damn is it fun being able to watch a game to the end and believe again like the Hartley era. God bless Elias Lindholm and Johnny Gaudreau. Our coach called a timeout strategically. For that alone this game was a success. Boy, it is such a great feeling to be watching a team with horses again. Leads are always in doubt, the team can work itself out of deficiencies, and if a couple of guys aren't going, it doesn't cripple through offense. I hope they can get some good goaltending because this team should do some damage this year. And the ATL from that night. And for good measure the ATL from after our 6-5 win at the Dome in November. I found the penalty confusing, the point of the embellishment penalty is to penalize a player for faking a penalty that isnt happening. If a player hooks a player enough to cause a penalty, then you cant embellish what is happening. You’d have to murder someone with your skate blade in the Tampa series to get called for anything. Exactly the way it should be. You get the sense that Gaudreau isn't well liked by officials. He takes a tonne of abuse. We aren't at ice level so we don't know what he is saying to the officials, but there must be some reason they don't like him. He should maybe just adopt a policy of never complaining, maybe he'll get some preferential or hell even fair treatment. I have no issue with players playing a rough game, but not if they start going out and cross checking guys in the face or attempting knee on knee hits. The refs seem to think that letting them play is great, until the match penalties get handed out, and then suddenly the next game everything gets called. From the perspective of the player I would imagine the lack of consistency in what is being called can get pretty frustrating. Watching these 2 back to back really pisses me off. ####! Fattenberg getting a hook/slash call (on a weak call that also puts us down 5v3) and Mckinnon sells it hard (and no embellishment call the other way). #### me that is infuriating. One handed and stick on stick. Just a soft as baby #### call to put them down 5 on 3 early. Really embarrassing officiating. Calling it embellishment is even worse when there was enough contact between the two that Nemeth fell over too. Was he also embellishing? Plus has there ever been a good camera angle of the too many men on the ice call? IMO calling that penalty in a playoff game when neither player coming on/off the ice actually was involved in the play or touched the puck is infuriating. Gaudreau is clearly trying to fight through it. The initial contact is right on his hands, but he's been told to stop whining and just play. So he tries to fight through it. If anyone embellishes its Mckinnon. On the biggest stage, I really do feel like the refs are trying to do their best. Its not easy managing these games when the intensity, physicality and stick work goes up exponentially. The inconsistency is what is infuriating. The standard for calls has been different in every single period. It gets in the players heads and creates situations where it feels like we're getting jobbed. What we don't really have much insight in, is if behind the scenes teams have been warned to watch the stickwork, or the stuff between whistles etc. Last edited by sa226; 04-17-2019 at 02:09 PM. That is infuriating. And on the point of refs liking certain players, and not liking other players leading to some players getting away with stuff and the unliked ones not so much. Aren't these refs supposed to be the best in the world? Shouldn't they drop any bias for the sake of being impartial and earning their jobs? I know they are human, but come on. More than a few games this year, and not just Flames games, they have directly been a factor in wins vs losses. Not putting all this on the refs at all. But man have they been horrible all season long. Hopefully in the off season GM's let the league hear it.